The Executive Office for Immigration Review (EOIR), the Department of Justice (DOJ) component with jurisdiction over the immigration courts and the Board of Immigration Appeals (BIA), recently released statistics on immigration cases. While those statistics provide a historical analysis for appearance rates at immigration-court proceedings generally, they paint a particularly bleak picture as it relates to appearance (and non-appearance) rates for unaccompanied alien children (UACs). The number of inadmissible UACs apprehended by the Department of Homeland Security (DHS) has ebbed and flowed, but the numbers in recent years are far above historical averages. As DHS noted in an April 2018 press release, prior to 2011, over 90 percent of arriving aliens were single adult males, whereas today, 40 percent are families and children. Border Patrol statistics reveal that the number of UACs apprehended along the Southwest border has increased from 15,949 in FY 2011, to 24,403 in FY 2012, to 38,759 in FY 2013, before surging to 68,541 in FY 2014. Efforts to mitigate that flow slowed UAC apprehensions to 39,970 in FY 2015, before they surged again to 59,692 in FY 2016. The number of UACs apprehended in FY 2017 along the Southwest border plummeted after the inauguration of Donald Trump, falling from 7,346 in November 2016 to a low of 997 in April 2017, according to U.S. Customs and Border Protection (CBP). For FY 2017, 41,435 UACs were apprehended along the Southwest border. The number of UACs apprehended in FY 2018, according to CBP, has ticked up again, reaching 50,036, not including 8,624 UACs who were deemed inadmissible of the ports of entry. In October 2018, the first month for which statistics are available in FY 2019, 4,991 UACs were apprehended along the Mexican border. If that trend were to continue, just fewer than 60,000 UACs would be apprehended in this fiscal year. Those numbers are troubling enough, however the EOIR statistics that I referenced earlier are even more troubling. The number of UACs who were ordered removed in absentia, that is, after failing to appear for immigration court, has skyrocketed from 450 in FY 2010 to 6,662 in FY 2018, an almost 1,500 percent increase during a period of time when the number of UACs apprehended increased about 272 percent (from 18,411 in FY 2010 to 50,036 in FY 2018). In fact, in FY 2018, half of all case completions involving UACs were in absentia orders, according to EOIR, compared to an overall in absentia average of 25 percent of all case completions. Any court system in which half of the parties required to appear fail to do so is in crisis. 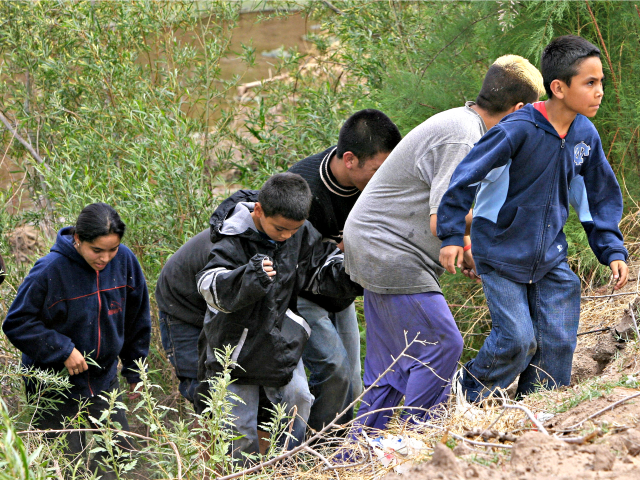 The huge percentage of UACs in absentia orders suggests that those individuals simply entered the United States to remain in this country illegally, and are not seeking protection from some danger that would entitle them to humanitarian relief, or to some other immigration benefit. Respectfully, Congress and the courts created this mess. In section 462 of the Homeland Security Act of 2002, Congress vested jurisdiction over the care and placement of UACs in removal proceedings with the Office of Refugee Resettlement (ORR) in the Department of Health and Human Services (HHS). In section 235 of the William Wilberforce Trafficking Victims Reauthorization Protection Act of 2008 (TVPRA), Congress distinguished between UACs from "contiguous" countries (Canada and Mexico) from aliens who are nationals of "non-contiguous" countries (everywhere else). A UAC from a contiguous country can be returned if the alien has not been trafficked and does not have a credible fear of persecution. Under the TVPRA, however, those other UACs are to be transferred to the care and custody of HHS within 72 hours and "promptly placed in the least restrictive setting that is in the best interest of the child." According to the Congressional Research Service (CRS): "ORR reported that children spent about 34 days on average in the program as of January 2016." My colleague Joseph Kolb has determined that between February 2014 and September 2015, 56,000 (80 percent) of the children were placed with sponsors illegally in the United States and an additional 700 were placed with sponsors in deportation proceedings. In FY 2014, according to CRS, most of the UACs who were released were placed with parents or legal guardians. The agreement, which was originally signed in 1997, has now been read [by the Ninth Circuit Court of Appeals] to create a presumption in favor of the release of all alien minors, even those alien minors who arrive with their parents. As DHS has stated: "Under the Flores Agreement, DHS can only detain UACs for 20 days before releasing them to [HHS] which places the minors in foster or shelter situations until they locate a sponsor." The agreement encourages UACs to enter the United States illegally, and encourages the parents of UACs to hire smugglers to bring them to the United States. Further, it encourages people to bring their own children (or children whom they claim to be their own) when they make the perilous journey to the United States, thinking that it will make it more likely that they (the parents or purported parents) will be more likely to be released if they travel with children. The reasons that those parents are subjecting their children to such hardships and abuse is as clear as the facts set forth above: Bring a child to the United States, and the child will likely be released, as will you. If I were to attempt such a journey with my son, however, I doubtless would be arrested by the authorities and charged with child abuse and child endangerment. I am personally acquainted with many of the people who have made these decisions, and I have no doubt that they had only the best interests of both the UACs and the nation at heart. As the facts above, and the EOIR statistics reveal, however, those decisions are having deleterious consequences, both for the children involved and for our system of justice as a whole.